Looking to the other side of the world for small manufacturers of innovative outdoor gear, Aarn Design from New Zealand popped up on my radar. A highly innovative backpack design, which lets you walk in an upright posture and eliminates body pain & discomfort is something many in the outdoors can benefit from. I hooked up with Aarn, founder of the Flow-Mo packs, and have him tell his story. Aarn, please briefly introduce yourself and tell us who you are. Since when are you backpacking, and how did you start? How often are you out backpacking nowadays? I started bushwalking as they call it in Australia in my teenage years. At university I learned to rock climb and did my first month-long trips in the SW Tasmania wilderness. At this time it was not opened up like it is now with access roads to dams etc. It is a very rugged area right in the path of the roaring forties with extremely dense bush ("horizontal scrub"). It is usually cold, wet and windy. We had supplies air dropped in to prearranged areas. Decades later one of my companions on these early trips disappeared without trace in the same region. After University I moved to NZ and did a years tramping and mountaineering. I fell in love with the NZ mountains and knew this would be my home. It was in NZ that I started to make my own gear and experiment with ideas. 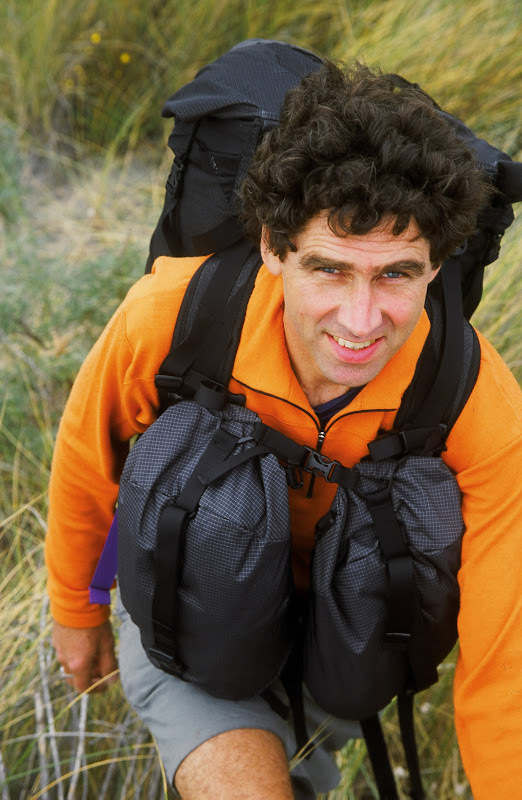 Are you a UL backpacker? If so, what is your typical baseweight? I try to be. It is not so easy in NZ as weather is extremely variable in the mountains and you can have 4 seasons in a day. But on short trips, the weather forecast is getting more reliable, so you can adjust your gear better for the expected weather. Typical baseweight around 8kg. Aarn Design makes a very innovative backpack, which helps the carrier to be more balanced. Can you tell us a bit more about this innovative rucksack and how you developed it? Once I started making my own gear I tried ideas current at that time. I really had no idea about biomechanics. As I used the gear I designed, I experimented with many different ideas. Some worked, many did not. Some showed promise, and I continued to work on these and refine them. The key areas I focused on were the fit - making all the body contact parts a mirror image of your body; the freedom of movement - allowing free body movement with the pack being completely stable; and the transmission of load to the body in a way that created the least strain on the body. When I experimented with balancing the load around the center of gravity of the body, I found remarkable benefits. Less strain on the body, better balance and easier movement, and the load seemed to require less effort to carry. The front Balance Pockets as we call them now were given their first serious test on a 3 month N-S traverse of the central section of the southern Alps here in NZ in 1989. Later when I was living in the UK, Ray Lloyd did a brilliant year long research study at the Department of Leisure and Sports Science at Leeds Metropolitan University. He compared a backpack with our Bodypacks in the same conditions in the lab, and these subjective impressions of mine were completely confirmed by hard science. The most energy efficient and strain free way to carry a load is with an upright posture with minimal loading on the shoulders and with the load distributed evenly on the front and back of the hips. We call this a body centered load carrying, when we can get the center of gravity of the load to be very close to the center of gravity of the body. A deep understanding of biomechanics has resulted from this 4 decade focus on creating the ideal load carrying system, and now biomechanical principles are the starting point for any new design. How did you start the company, and what do you foresee for the future? I have designed outdoor equipment for a living for 35 years. For many years I was a freelance designer and did work for outdoor companies in NZ, Australia, UK, Japan, and USA. Over the years I have taken out around 10 patents on packs and tents. When I returned to NZ in 2000, after many years in Europe, I found design work was hard to find. My partner and I decided to take the plunge and start our own brand. While it has been a rapid learning curve learning how to run a business and not just design gear, it has been rewarding being able to introduce ideas and concepts onto the market which were too different for my previous clients. I knew that other companies were not prepared to take the risk of introducing a radical carrying system on the market- one that made their current backpack designs obsolete. I also knew that once we had successfully established Flow-Mo Bodypacks on the market, other companies would start to follow our biomechanically efficient ideas. Already we are seeing a big player, Black Diamond, copy our movement principles on their pack range. We are at the stage now where we need expertise to take the company from a small niche player to larger company which can make the benefits of our body-centered load-carrying systems available to many more people. Aarn, we love to be let in on the work-in-progress stuff! Can you let us know what kind of new products you're working on the moment? At the request of professional photographers, we are introducing large volume Photo Balance Pockets suitable for large bodied SLR cameras like the Nikon D3. We are refining the side connections between the Balance Pockets and the pack on our Marathon and Mountain Magic models so that they work well, even without the shoulder straps. i.e. we are creating a completely shoulder free load carrying system option. We are looking into the possibilities of using Cuben Fibre on some of the models in our Ultralite range. For our Travelite range next year, we have a new Earth Glider hybrid travel pack with a wheel frame; the wheel frame is complete removable to give a 80L trekking pack weighing around 2kg. We have a carry bag, Pack Porter, for protecting your pack for airline travel. Add the wheel frame to this and you have probably the worlds lightest wheel-able travel luggage: 100L capacity at 1.75kg. How works the R&D at Aarn Design, do you have a need yourself that you try to fix, or do some of your clients inspire you for new products and ask you for solutions to their problems? Yes, all 3. Probably still the majority of needs for improvement come from my own use. I have this vision of equipment which works amazingly well. If anything is not working this well I start to think about how it can be improved. Often a potential area for improvement or a new idea arises during a long trip. There is lots of time to think about gear function when you are using the gear continuously for many days. However, many suggestions and problems come from other users. We have a free tester program here in NZ where anybody can try out a pack before they buy, in return for filling out a detailed feedback form about their experience. We have hundreds of these forms and it gives us a good idea if there are any problem areas in a wide range of uses. What works well for me may not work for someone with a completely different body shape, or doing activities with a Bodypack on which I don't do. And then there is the ease of manufacturing to consider, so feedback from the factory is also important. Once a need or problem is identified, I let it mull around for a while until a possible solution comes up. Then it needs to be tried out by making a prototype or modifying a current model. I make the patterns and prototypes in the studio pictured. I like to test it first and then hand it out to our small team of outdoor enthusiasts who go into the wilderness at every available opportunity. Once our team is completely happy with it, we send a sample and patterns off to the factory for sampling. If a improvement works on one model, we try and upgrade the whole range. Completely new products usually arise due to requests from current users. The first Photo Balance Pockets arose from a number of professional photographers using our standard Balance Pockets for their cameras. They wanted something more specifically designed for camera gear. After the first season on the market, we developed the second generation design by incorporating their needs for the pockets to be more flexible in their compartment set up. Then recently we have added a large version for the largest SLRs to be released next year. The Marathon Magic series originated when one of NZs top adventure racers, Marcel Hagener, used one of our daypacks, Liquid Agility with Compact Balance pockets in the winning team of one of the World Raid series of adventure races. We worked together to come up with a design which satisfied his requirements. Most important was pack stability, freedom of movement, lightness and ability to access items while running, or access items when cycling with one hand. The frame also needed to flex from with the back from straight when running to curved when cycling. Each year these models have been on the market we have made refinements based ion feedback from many users. What is the bestseller from Aarn Design, and where do your customer come from? The answer to this question varies in different countries. In Australia and NZ we sell more of our large volume models, in Europe it is more of the daypacks. In those countries where we have been available the longest, people nearly always buy the full Bodypack (pack + Balance Pockets). In new markets people often buy the pack first, like how it works, and then buy the Balance Pockets. Are you in touch with other cottage manufacturers in New Zealand, Europe, the USA, Japan or other places? I try and keep up to date with what they produce, but do not know many of them personally. I use all the packs in our range depending on the length and sort of trip. I try to refine the design of each model so I cannot pick a favourite! For other gear I go for the lightest and biomechanically/ ergonomically efficient designs I can find. The only product category where I have clear favourites are the recent advances are footwear, designed to mimic barefoot walking and running : Five Fingers for summer walking, Innov8 shoes on rough ground. Yes, these work with a load on! I still look for a better solution for glacier/snow work than the heavy boot. One kilo on the foot is uses equivalent to 6.4 kilos on the back, according to the latest research by the US army. When and where was your last longer backpacking trip, and what was your baseweight? Are you planning to get out for a trip soon, and enjoy the summer season? The last substantial trip was in Feb: an 8 day E-W crossing of the S Alps here in NZ, up the Rakaia R to Lauper Pass, up the Sale Glacier onto the Bracken Snowfield for 2 days, and descent down the Evans Glacier to the Wanganui R to the W coast. Base weight about 10 kg including climbing gear, helmet etc. Unusually we had a week of brilliant sunny and settled weather. Next summer is 6 months away here, but yes another long trip is being planned. I think the Ultralite enthusiasts are raising the bar to what is possible, and this is forcing all manufacturers to give weight reduction a higher priority in the design process. This trend will continue: Reduced weights from main stream manufacturers, enthusiasts and cottage manufacturers developing lighter and lighter designs and using exotic new materials.